**** Chosen by Winner: Jacki S.
Todd Hunt's Tradewater Hunter is 10.75 inches overall with a 5.75-inch O1 High Carbon Tool Steel full flat-ground blade. The handle is Black Micarta with a Curly Maple inlay. The full tang extends past the end of the handle to provide a hammering flat. A leather sheath is included. 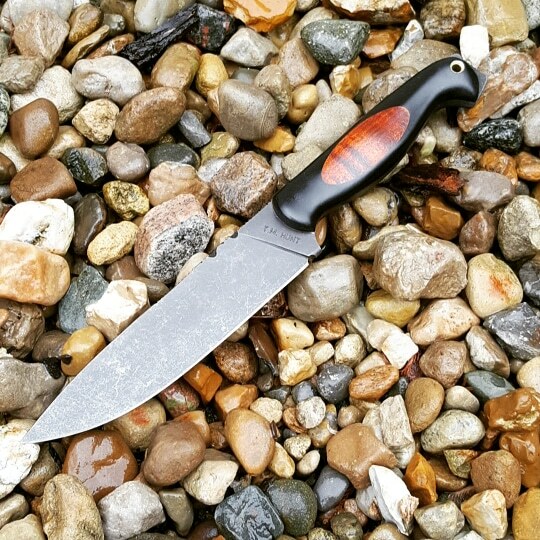 Todd Hunt, owner of T. M. Hunt Custom Knives, grew up in Seymour, Indiana. From a very young age, he remembers standing on a milk crate to be able to see over the work bench to watch his father make a few knives a year as a hobby for friends and family. “It always amazed me how something so useful could be made with nothing more than a couple of tools, and some hard work,” explains Todd. It definitely forged a lasting image of craftsmanship and what a quality tool was supposed to be. Throughout his life, Todd has enjoyed many hobbies including hunting, fishing, camping, martial arts, and metal fabrication. All of which taught him several different ways to use knives. His career took him to the machining trade and he he learned the value of high quality materials and metallurgy. As time went on there were always new interests, but the one thing that remained was his love for man’s most basic and used tool, and the craft of making them by hand. So much so, that he quit his full-time job of almost 20 years to pursue his passion, and set out to try to reintroduce not only fine craftsmanship, but a sense of accomplishment and pride in each one of his products and that he has done, since starting T. M. Hunt Custom Knives officially in 2013. Todd has sold his knives in over a dozen different countries, has been featured in 6 different magazines to date, sold knives to celebrities, and even had his knives featured on the Food Network and the Discovery Channel.